Talbot – sharing with John Martin – got a blistering start in this afternoon’s fourth race advancing from sixth to third in the opening sector of the race. After a strong battle with Max Twigg, he was then setting about chasing down the front-runners before a slight lock up at turn three. This cost the balance of the Walkinshaw GT3-prepared Hot Wheels™ Car Care Products machine, however Talbot was able to settle the car and then start a charge towards the top three. While he was doing that, an attack was coming from behind in the form of Geoff Emery – all the while dealing with the heavy lapped traffic that didn’t make life easy for the front runners. 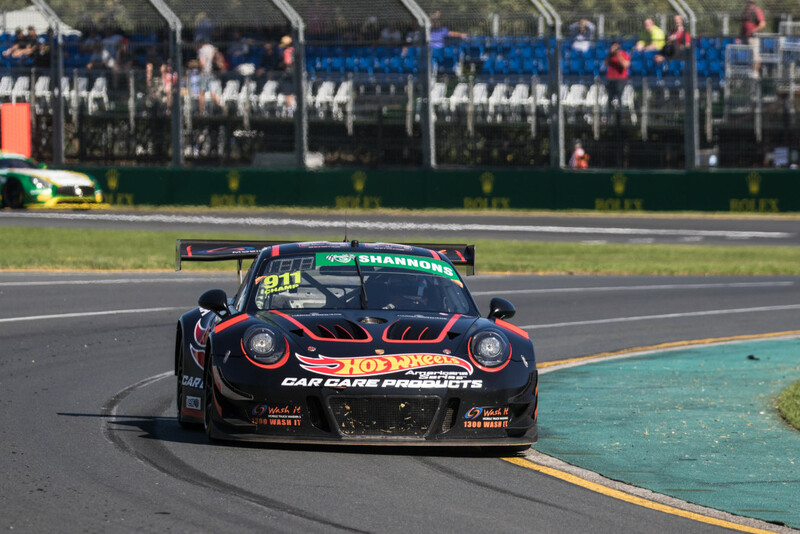 The Grand Prix weekend proved to be a challenging one as the Hot Wheels™ Car Care Products brand was launched as part of the Australian GT paddock – with differing weather conditions and a fresh aerodynamic package being applied to the Porsche 911 GT3-R. The weekend gave the Walkinshaw GT3 team plenty of data to work with before heading to the brand new The Bend Motorsport Park in Tailem Bend, South Australia over the weekend of April 14-15. Liam Talbot Racing is supported by Hot Wheels™ Car Care Products in addition to MEGA Fuels, Hardy Brothers Jewellers, WashIt Australia Mobile Truck Wash and Urban Maintenance Systems. “We started the race off pretty strongly getting past a few guys then the tyres went away a little bit, but overall the Hot Wheels™ Car Care Products Porsche was epic all weekend long. “Towards the back end of the race today, the balance was coming back nicely and I had a few good battles and was pushing for the top three. “To come away from the weekend at this track with no damage and with a swag of points was important for us. “John did a tremendous job yesterday in terrible conditions to bring the car home in third placing, so that was a real positive for us. “We’ve learnt a lot about the new package and there is absolutely no way that we’re going to sit still – we will continue to work away at it and get it where we need it to be.